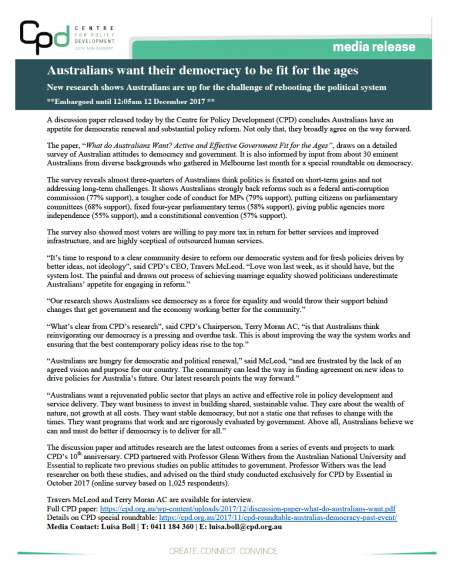 This paper draws on new attitudes research commissioned by CPD on Australian attitudes to democracy and to government. 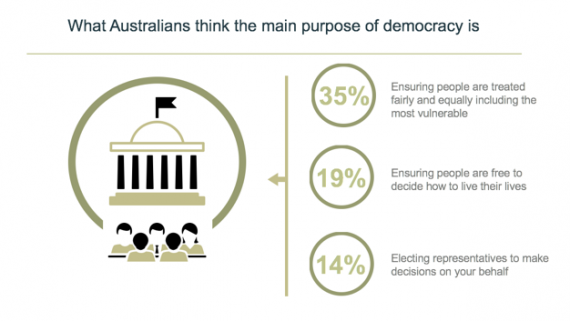 It also features insights from a special roundtable on Australia’s democracy convened by CPD in November, as part of our 10th Anniversary Event Series. We think this work is important and comes at a vital time. There are reminders every day that our democracy is struggling under the strain of both new and old challenges. The arduous and painful path to marriage equality despite broad public support is one example. The rolling crisis over the citizenship status of parliamentarians is another. And this isn’t a temporary blip or a recent phenomenon. 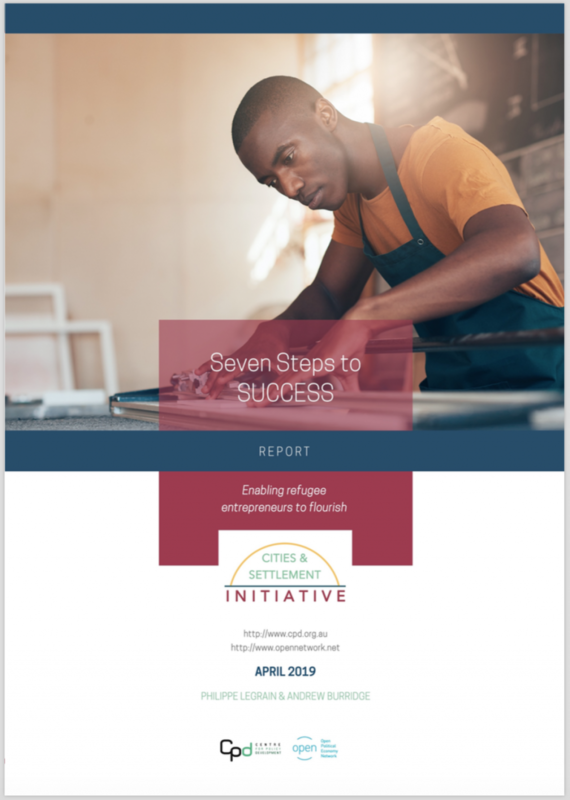 For a decade or more we’ve been treading water while the big challenges of our time – climate change, inequality, the future of work, sustainable growth, and Australia’s place in the region – have gathered steam. We need better answers, and we don’t have any more time to lose. 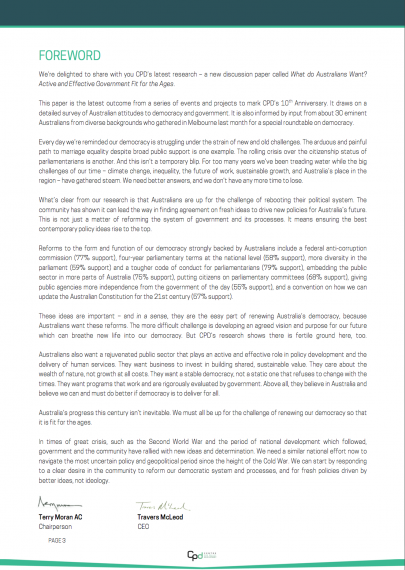 What’s clear from our research is that Australians are up for the challenge of rebooting their political system. 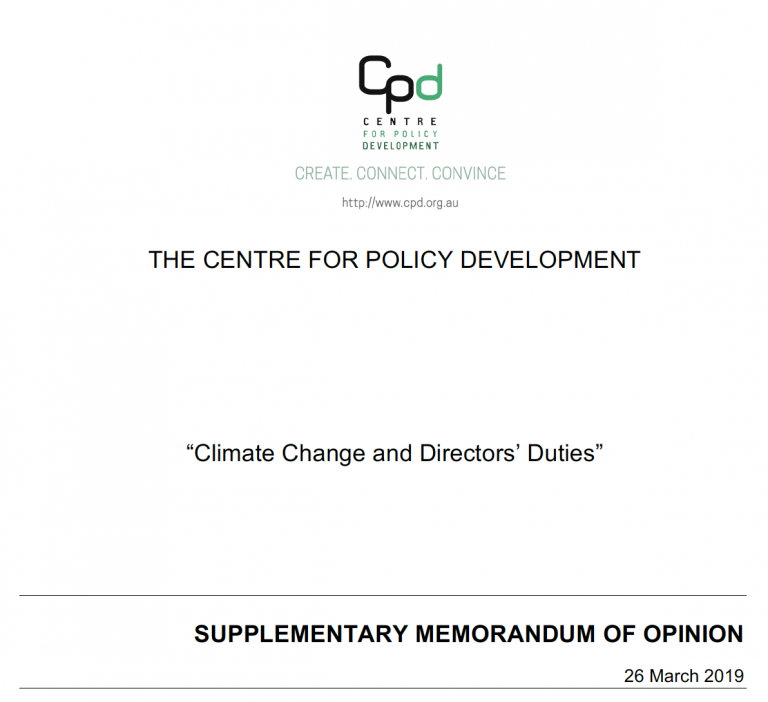 The community has shown it can lead the way in finding agreement on fresh ideas to drive new policies for Australia’s future. This is not just a matter of reforming the system of government and its processes. It means ensuring the best contemporary policy ideas rise to the top. 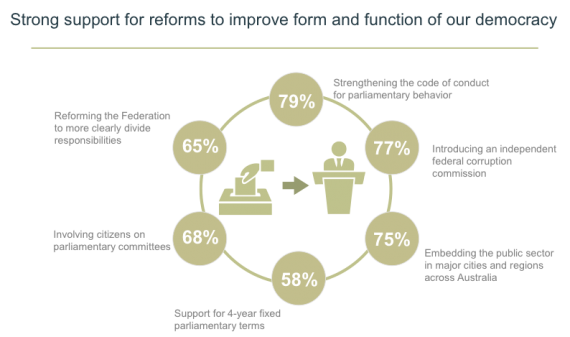 Reforms to the form and function of Australia’s democracy strongly backed by Australians include a federal anti-corruption commission (77%), four-year parliamentary terms at the national level (58%), more diversity in the parliament (59%) and a tougher code of conduct for parliamentarians (79%), embedding the public sector in more parts of Australia (75%), putting citizens on parliamentary committees (68%), giving public agencies more independence from the government of the day (55%), and a constitutional convention on how we can update the Australian Constitution for the 21st Century (57%). These ideas are important – and in a sense, they are the easy part of renewing Australia’s democracy, because Australians want these reforms. The more difficult challenge is developing an agreed vision and purpose for our future which can breath new life into our democracy. But CPD’s research shows there is fertile ground here, too. 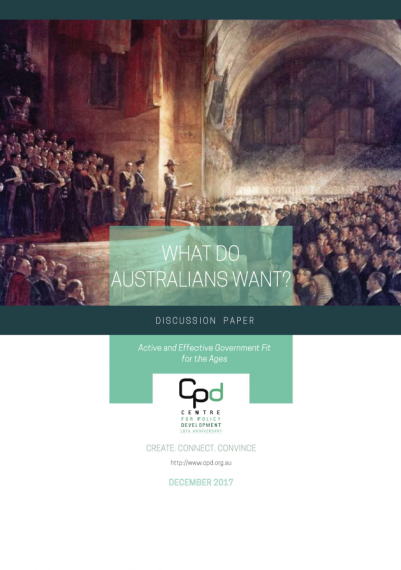 Australians also want a rejuvenated public sector that plays an active and effective role in policy development and the delivery of human services. They want business to invest in building shared, sustainable value. They care about the wealth of nature, not growth at all costs. They want a stable democracy, but not a static one that refuses to change with the times. They want programs that work and are rigorously evaluated by government. Above all, they believe in Australia and believe we can and must do better if democracy is to deliver for all. It’s time to respond to a clear community desire to reform our democratic system and processes, and for fresh policies driven by better ideas, not ideology. Australia’s progress this century isn’t inevitable. We must all be up for the challenge of renewing our democracy so that it is fit for the ages. 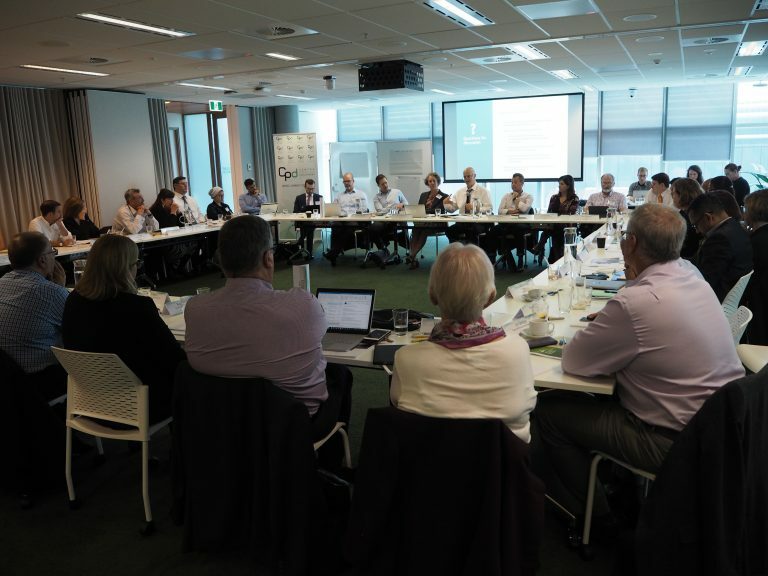 As part of the research, CPD partnered with Professor Glenn Withers from the Australian National University and Essential to replicate two previous studies on public attitudes to government. Professor Withers was the lead researcher on both these studies, and advised on the third study conducted exclusively for CPD by Essential in October 2017 (online survey based on 1,025 respondents). Terry Moran AC, CPD’s Chair, addressed some of the themes of CPD’s attitudes research in a speech for IPAA Victoria on 21 November 2017. Read the speech here, along with the coverage in The Guardian and The Mandarin.